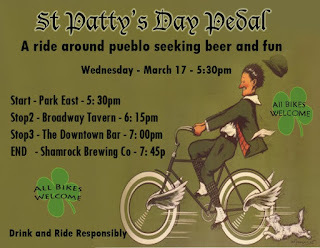 Come have some fun, drink a few beers, eat some food, socialize, ride around Pueblo and celebrate bicycles and St Patrick's Day! Bring lights if you have them, as it might be dark by the last stop. Be safe, drink and ride responsibly, and have fun! It is good I could not post my previous writing. It was simply awful. I will not be joining you on the ride on Wednesday, but I wanted to contribute. The need for lights is clear, so I have gathered some lights. They are promotional junk made in china, but they can be fun. I have placed them on my VW van at 1921 Grand, behind the other car in front. Take as you need, just show some respect and do not make a mess. It amazes me how LED has transformed lighting.